Entdecken Sie vulkanische Landschaften und atemberaubende Ausblicke auf der neuseeländischen Südinsel bei diesem 9,5-stündigen Tagesausflug nach Akaroa ab Christchurch. Besuchen Sie die beliebtesten Sehenswürdigkeiten wie Governor's Bay, Gebbies Pass, Lake Ellesmere und Lake Forsyth mit Ihrem Reiseleiter. Fahren Sie hinauf auf die Halbinsel Banks, und genießen Sie eine wunderschöne Aussicht über den Hafen von Akaroa und den vulkanischen Krater. Anschließend kosten Sie lokal hergestellten Käse und bewundern die koloniale Architektur um Akaroa. Bei einer Hafenrundfahrt mit dem Katamaran sehen Sie Meerestiere und Vögel, darunter die seltenen Hector-Delfine. Ein köstliches Mittagessen im Dorf Akaroa macht Ihren Ausflug komplett. Really enjoyed this tour. Had a great day. Hermoso paseo, paisajes divinos. El guia muy ameno. El paseo en barco el pico de la excursion con la vista de los delfines. This tour was fantastic! We had a delightful day in Akaroa to include a delicious lunch, time to walk around the town, and a delightful boat ride along the coast and back into the harbor. Loved this tour! Cally was wonderful, upbeat and full of good information. We saw fur seals, albatross and blue penguins on the boat trip. Lunch at Bully Hayes was delicious and we had plenty of time to eat as well as explore Akoroa. A perfect day! Although the weather was rainy, the Driver/Commentator was great. She kept us well informed of the areas we drove through. She accomodated us by making an additional short stop in the french section of Akaroa. With the cancellation of the boat due to the poor weather conditions, she was able to make alternative schedule by going to the Antarctic Museum. Unfortunately it was raining, windy, and cold. And this was a summer day. Activity is weather dependent. 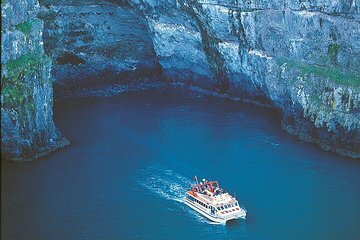 Inspite of the weather, I still enjoyed the sites: the greenery, the towering cliffs, the cathedral domed cave, and the ocean. The marine life was awesome: Hector dolphins, fur seals, and penguins. A sunny and calm day would have made this a perfect excursion. It was a lovely day. Our driver Sue took as to many beautiful places of the region and the boat ride was amazing, not just because of the dolphins and other animals but also because the sea and the mountains of Akaroa are very special. The tour started with a beautiful drive through the plains and hills from Christchurch to Akaroa. Our driver-guide Scotty was amazing -- so informative about the area and what we were seeing along the way! Even though it was a holiday, we were still able to stop at Barry's Bay Cheese Factory, see a video of the cheese making process, sample some of the cheeses, and make our purchases. The free time in small sea-side town of Akaroa provided enough time to visit the shops and enjoy a walk along the harbor shore. Lunch at Bully Hayes was good but nothing special -- there were other dining options nearby that would have been just as good if not better. The harbor cruise was the highlight of the tour. Andrew, the driver-guide on the boat, provided informative as well as humorous commentary through the cruise. We saw lots of Hector's dolphins, and they swam right up to the boat -- some even swam right along the side of the boat! We also saw some fur seals and several sea birds. 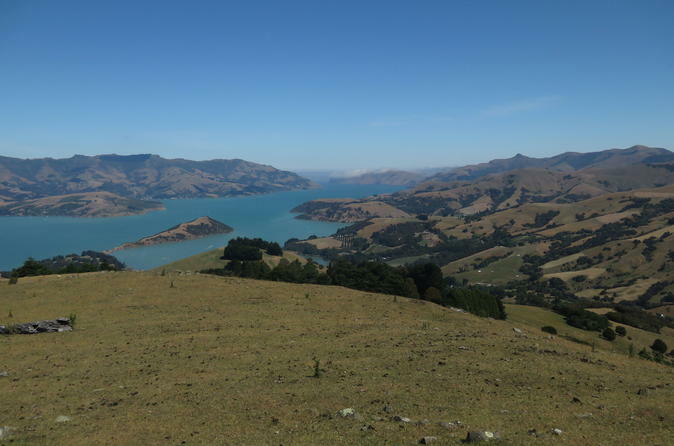 On the return drive, Scotty took us on a different route back to Christchurch, along the top of the hills/mountains surrounding the Akaroa bays -- the views were absolute beautiful! I would highly recommend this tour it's a great way to see the beauty of the area southeast of Christchurch and experience seeing the rare Hector's dolphins!